For each newsletter edition, we will be introducing a member of the i-Link family. Get to know the faces behind some of the names. For this edition, it will be our Operations Director - Muriel. Muriel has been at i-Link for 9.5 years and has over 20 years of experience in the industry. Anyone who knows Muriel, would know that she has an answer for just about any Market Research related question you can throw at her! Whilst completing her degree in Marketing and Management, she worked for Woolcott Research as a face-to-face and CATI interviewer and was quickly promoted to team leader and supervisor. After 8 years, she moved on to N= Research, and was instrumental in gaining IQCA accreditation for a remote call centre where telephone interviewers all worked from home. Shoes - coloured shoes! High heels, low heels - the brighter the colour the better! Fiji (in the villages, in the town with my friends - real people) - it ALWAYS reminds me of how lucky we are to live in Australia. Seinfeld - definitely Seinfeld. 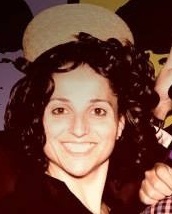 Apparently I look like Elaine - what do you think? 5) One thing most people wouldn't know about you? That I am an extroverted introvert!